The importance of play therapy. Play therapy is a theoretically-based approach that allows children to share their thoughts, feelings, needs and experiences in an alternative way. Developmentally, children often lack the verbal language skills to express themselves effectively. Play therapy provides a natural method for them to reach healthy solutions for their problems and identify ways to think about, feel, and articulate their needs. The play therapy room at NFRC provides a warm and inviting setting for children to explore and facilitate self-expression by providing a wide array of play materials carefully selected for play therapy, including toys, play materials and creative expression tools. 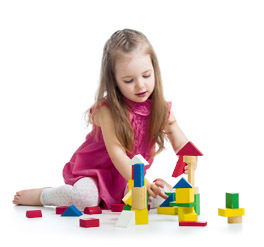 Play therapy benefits children of all ages, but is especially appropriate for ages 3 to 12. Often times it benefits the child to include other family members in the therapy session, which are organized and regulated by the therapist.